The Hibernate Annotations Example in Eclipse tutorial shows you how to create hibernate 4 application with standard JPA annotations. This application will performs CRUD operations on database. The Java Persistence API (JPA) is a Java application programming interface specification that describes the management of relational data in applications. And Hibernate implements this JPA specification. Hibernate also supports it’s own non-standard annotations to work with. I recommend you to work with Standards and use standard annotations. The stuff that we need to do before creating the Hibernate Annotations Example in Eclipse is MySQL installation on local computer and create database and table. You can aslo use MySQL Workbench or PhpMyAdmin to work with Mysql. We create a simple POJO class named Student which be mapped to STUDENT table in database. This table is created in the above. This POJO class uses standard JPA annotations. @Entity indicates that this class is Entity Bean. @Table indicates that database table will be mapped with this class. You can specify catalog and schema attributes with this annotation. @Table annotation is optional and unqualified class name is used as table name in this case. @Id indicates that the field or group of fields is primary key of entity. @GeneratedValue may be applied to a primary key property or field of an entity or mapped superclass in conjunction with the Id annotation. GenerationType depends on the underlying database. For example, on MySQL, IDENTITY is supported (strategy = GenerationType.IDENTITY) and on Oracle SEQUENCE is supported (strategy = GenerationType.SEQUENCE). @Column idicates that the class field will map with the column name in database table. This annotation is optional too and field name will be used as column name in this case. It also supports other attributes like unique, nullable, name & length. Finally, don’t forget to It is a good practice and is required to work with collections or detached instances. We will also demonstrate these steps in our program. The program will perform CRUD operations like saving few records, list all of the persisted records from database, update a record in database and delete a record in database. 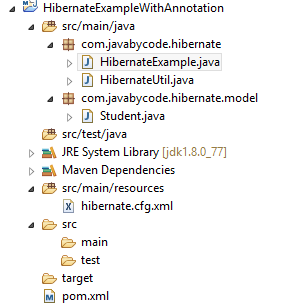 Now we create Hibernate Annotations Example in Eclipse like below. That’s all on the Hibernate Annotations Example in Eclipse tutorial.